Following the disappearance of his mother, Geordi believes he is in contact with her while using an experimental remote probe interface. Why is Geordi's VISOR missing when he's in the interface? If what we're seeing is a representation of his self-image, why does Geordi think of himself as being separate from his VISOR (but not from, say, his uniform)? And why, when we see things through his point of view, does everything appear as we would see it instead of the way Geordi's accustomed to seeing things? There's some interesting subtextual motifs going on here. Geordi has a hard time communicating with anyone unless it's through some form of technology. He even likens interfacing with the probe to being on a first date, as though he is more capable of connecting with technology than he is other people. This is consistent with what we've seen from Geordi in the past, in episodes like "Galaxy's Child" and "Aquiel." In "I, Borg," it is Geordi who is first able to bond with the biomechanical Hugh. Indeed, Geordi's best friend is an android (and the first person he turns to when he starts to feel distress in this episode), and he can only see the world around him through his VISOR. Though Geordi's character is easily the least explored of the main crew, there is some depth there that this episode is attempting to bring to light. When "Geordi" first arrives on the Raman, there's an extended shot of him walking down a hallway, checking on a dead body, moving a beam, opening a door with a phaser blast from his hand, and then walking into the magnetic storage bay. It's a technically impressive shot, because it's all one take, including a full three-hundred-sixty-degree pan around Geordi, an effects shot, and plenty of atmospherics and obstacles that could have been disrupted by crew and wild walls. Somebody behind the scenes (probably Robert Wiemer, the director) is flexing their film-making muscles. When Riker goes to Geordi and tells the story about his childhood, Jonathan Frakes overacts it terribly. Immediately after that scene, when Geordi tells Riker that he's not going to quit, Riker should temporarily relieve him of duty. There's no reason to believe that everything Geordi experiences during the interface is anything but a hallucination. It seems more likely that his fantasy turned on him than that there are "subspace beings of some kind" who are able to read his thoughts "through the interface somehow." The solution to the puzzle just seems incredibly arbitrary and stupid, and I would rather believe that it is the product of Geordi's poor imagination. Even considering how much I want the show to explore Geordi as a character--and how much potential the premise contains to do just that--this episode is too derivative of earlier episodes, with every plot beat and moment ripped directly from better stories. 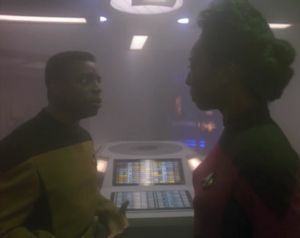 Characters being unable to cope with the loss of a loved one is covered in "The Bonding," "Hero Worship," and "The Loss"; one of the crew deciding to brazenly disobey a direct order from the captain, being confronted by a fellow crewmember about it, and then having the fellow crewmember agree to help rather than turn him in happened in "The Outcast"; aliens offering personal illusions to manipulate someone into giving them what they want has happened in more episodes than I care to list; a single crewmember being certain that they're right about something when everybody else tells them otherwise happened in "Remember Me," "Realm of Fear," and "Quality of Life" (among many others); etc. Even the central science gimmick--the machine-man interface--seems like a step backward, even though it's never been seen per se in TNG, as even by the standards of 1993, it isn't a technological leap that seems four centuries away. (I wouldn't be surprised to learn that something like it is in the experimental stages already.) I'm not going to say that the show has run out of ideas at this point, but it's definitely starting to turn stale. Number of episodes in which a member of the crew is subverted by an alien lifeforce: 27. We never learn what happened to the Hera.